We had the opportunity to head down to Charleston, SC over Thanksgiving Weekend for a fab family wedding. While in town, we spent Saturday morning checking out the historic downtown, which was wonderful. Side note: Tip #1 for visiting Charleston is don't go in August like I did last time. The humidity is suffocating! But November? Gloriously pleasant! Definitely have seafood while you are in town, wherever you eat. Whether it's shrimp and grits, oysters on the half shell, or lobster salad, it's all wonderful in this seaside town. These Southerners know their comfort foods with fish. 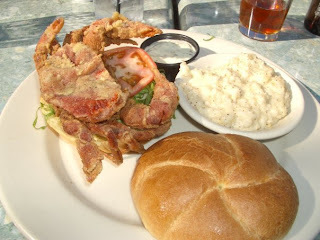 Check out this fantastic soft shell crab sandwich we got for lunch! Have you tried soft shell crab before? It's weird, because they cook the whole thing up at once, but the whole thing is edible. Once you get past that odd-ness, it's so tasty underneath the somewhat crispy outside shell. Try Aja or Atlanta Fish Market if you want to try some closer to home - both places have fantastic versions, sans sandwich. The easiest thing to do in Charleston is just to walk around the streets. We parked down by the South Battery and then walked North towards Market Street, where there's the historic market full of local artisans and their crafts. There are all sorts of cute boutiques everywhere around it too, I wish I had written down one or two to tell you about, but I am pretty sure you can't go wrong just meandering around. 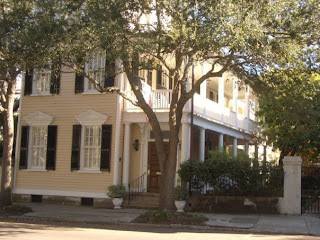 Charleston is history-rich, and doesn't stop with the gorgeous buildings. Graveyards abound - behind churches, behind homes, randomly on corners. 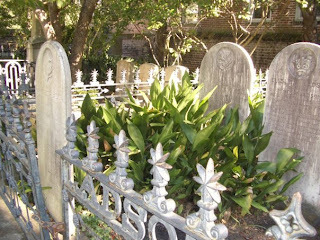 Most are open to the public, so wander through and check out the intricate tombstones, many dating back to early 1800s. I have done the local Ghost Tours before too, which are a fun event after dinner out in town. And if you get the chance before you go, drive up through the city and over the Arthur Ravenel Jr. Bridge (Rt. 17) - it's amazing! You get a great view of the Charleston Port, including some cool naval ships. What are your favorite Charleston spots? Restaurants, bars, hotels, etc. I want to try them out next time I am in town for longer than one morning!